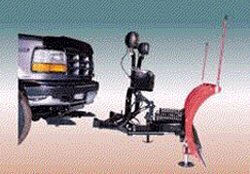 8 1/2' assembly Includes blade, frame, hyd., lights, controls and wiring harness QUICK-HITCH SYSTEM - Self-aligning drive-in mount allows for hookup in seconds. -	Deep, high curve blade. -	Externally mounted hydraulic pump with clear poly reservoir comes off with plow. -	Hydraulic scissors lift cuts transport bounce, eliminates chains. -	Compression springs - instead of extension springs. Blade Width	8' Blade Height	30" Gauge of Steel	12GA Vertical Ribs	8 Compression Trip Springs	4 Plow Width @ 310 Angle	7' 3" High Carbon 1084 Steel Cutting Edge	3/8" x 6" Weight # (approx.) 746 See our Specials section for this item.